Joanna: Hi, it’s Joanna Oakey here. 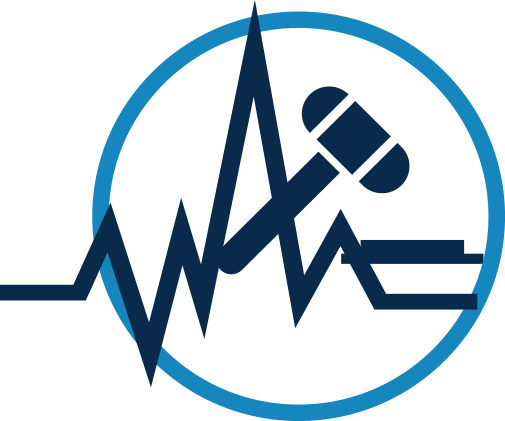 Welcome back to the Deal Room podcast. Today we are talking to Denise Hall from businessbrokers.com.au. 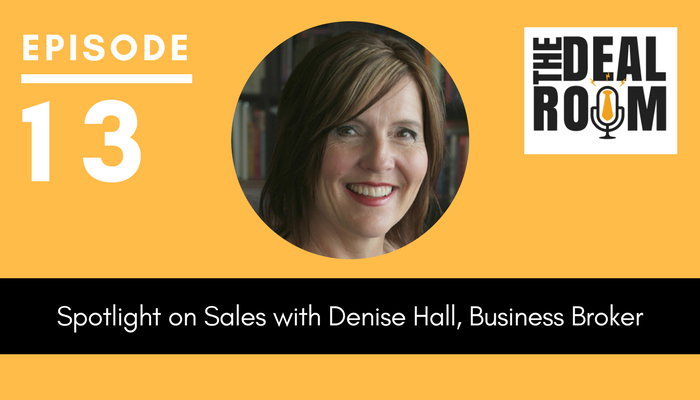 Denise gives us a little bit of a different perspective today coming from the perspective of someone who has built and sold a business and then after that turned to become a business value analyst, exit strategist and a broker to businesses who are looking to sell their business. She has a unique perspective that started from the client’s side, from the side as the business owner that was building their business to sale, and to now dealing on a daily basis with those business owners that are selling their business. She had some interesting things to say in terms of what businesses should be doing to keep themselves sale already and what accountants and other professional advisers who are working with businesses should be doing and bearing in mind when they’re dealing with these businesses as they grow and evolve into something that one day might be ready to sell. Joanna: Hi Denise! Thanks so much for joining us here today on the Deal Room podcast. Denise: My pleasure. Thank you for having me. Joanna: I thought maybe the best thing for us to do Denise today is maybe just start with going back over a little bit of a history. Maybe if you could give the listeners here a bit of a snapshot into where you were before you started being involved in consulting businesses around the exit. Denise: Sure. So I’ve been an exit strategist, business broker and business value analyst for approximately six years. Prior to that, I had my own business that was 15 years old and I got to the stage where I decided to take it to market along with a business partner. We did that. The GFC hit. That hurt, but nonetheless we went through the process and we got it sold. It was doing seven figures at the time we took it to sale so it was a nice small business that we could just pack away. We had clients and contracts and so forth. So we went to market, had that sold and then the group that sold the business is essentially who I am until now associated with. Joanna: There you go. And so that’s how you met your future partners. Great story. 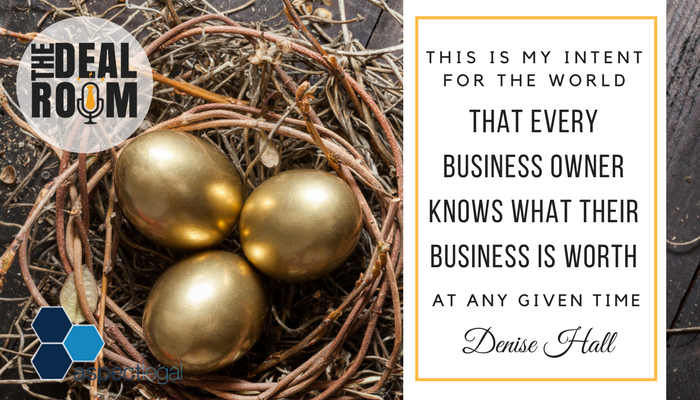 Denise: Essentially, they said to me “Well what are you doing next?” A business broker is a whole lot better if they have a whole lot of business experience behind them because they understand the business, the small business landscape, for a start. Secondly, there’s not that many female business brokers around. And thirdly, females own a third of Australian-owned businesses in Australia. So it kind of makes sense about servicing that market which is the role that I have stepped into and continue to play. Mind you, I have clients both male and female. But nonetheless the option is there should either parties need to have a discussion about selling or actually getting out. Joanna: I’m really interested to know what your experiences were when you sold that first business? Denise: Well, I didn’t know anything. Joanna: That’s what I hear a lot of business owners say. Quite often many business owners we deal with haven’t gone through this process before. And if they have, they haven’t gone through it many times. It’s a new space but it’s always interesting for me to understand (and I think for some of the listeners who are accountants and brokers to sort of understand) what it feels like to walk in those shoes. Maybe you can give us a bit of a feeling of what was going on for you at the time and how the process felt for you. Denise: Sure. Even present day, something that I have learned as a result is what I’m stunned at on a regular basis is that a business owner does not know what their business is worth at any given time. Often that business is maybe their second largest asset to their home, maybe their largest depending on the size of what they’re doing. And yet, I could ask them “You know how much your house is worth don’t you?” And they’ll say “Yes. And pretty close to it. So tell me what’s the value of your business then” and they can’t do it. Or they’ll default and say “Talk to my accountant.” Wrong Answer. This is an asset sitting in your asset portfolio, creating cash flow for you and your family. The fact that you don’t actually know what that’s worth is indicative of just a lack of knowledge. You don’t know what you don’t know. Therefore, building on that, you also don’t know what you think is valuable in your business is necessarily. Joanna: And that’s the reality isn’t it? Joanna: I see this a lot. I see businesses think they’re going to be able to walk into a fairly quick sale and then suddenly they’re slapped with the reality that the business is not worth what they thought it was worth. Denise: That’s the initial conversation. If I have my way I would have every business owner (and this is my intent for the world) is that every business owner knows what their business is worth at any given time. If that means we do an appraisal every year, we do an appraisal every year. Depending on their market, it might make sense to do it every two years or whatever the number is. Nonetheless, it’s this notion of knowing where you stand at any given time. Because what happens is, as you say, I have business owners coming to me and they’ve already started making plans on a number they’ve got in their head. And that number could have come from a whole raft of different places. There’s no wrong rhyme or reason in that. Essentially what happens though is they started making decisions from a lifestyle choice, from the next chapter choice, depending on what all that is. They’re coming to me and then I’ll take them through our appraisal process. And in some cases, I’ve halved what they thought it is worth. And they crumble in front of me. It’s awful. And of course, then I get grumpy because I think why on earth are you only finding this out now. That’s wrong. That’s why I want business owners to know on a regular basis so that they’re making decisions that are informed. Joanna: And so you said that part of this comes from your learning when you sold your first business. How did that impact you when you sold your business? Were you one of these people who you’re talking about that had sort of not realized the value until the point of sale? Denise: Oh yeah. I thought I could justify something astronomical. But what I know now is that you can’t. But you think you can. And even interestingly enough, because I had a business partner in the business at the time, even having that discussion prior to even getting to talk to a broker is something in and of itself. You’re talking about not only the business, the entity and the mechanics of it, but you’re talking about the humans that are in the middle of it. And so I started the conversation. It wasn’t something she wanted to entertain. It probably took 12 to 18 months for her to, or 6 to 12 months, for her to decide what she wanted to do. I thought she’d buy me out but she didn’t want to do that. She didn’t want to do it on her own. So if we wanted to get out or I wanted to be able to facilitate my way out, the only other option we had was to go to market. And she was OK with that once we had got to that point. But even that discussion took that length of time because if it’s not something that is discussed on a regular basis or your intent for the next year or a bit like goal setting. Business owners don’t goal set with each other. They just can’t do it. You might do it for the business, but they don’t do it with each other. It’s just this human stuff. So it took that long to get to there. And then of course once we went to market, the GFC hit so that what would normally now take six, nine, twelve months to do, took me two years. And so that had its added pressures as well. As a business owner who may have gone down this path before, once you flip that switch, it’s really hard to stay engaged in the business. From a selling point of view, I want that thing trending up like it’s never trended before. Now as a business owner wanting to get out, that’s the last thing you can be bothered doing sometimes. There’s a real kind of dichotomy – I don’t want to do it but I have to do it. It’s just really tricky. Joanna: What have those insights done for you moving forward in relation to how you work with your clients or people who approach you? Denise: I ask the questions that don’t get asked. Joanna: And what are they? Denise: They’ll be things like, so for me (well for us actually) there’s three parts to the exit question. First part is around the actual financial position of the owner. The second part is around the saleability of the business itself. And the third part is around the business owner personally. So let me go through those. First one around the financial position of the owner. What role does the business play? Is it the be all and end all? Is it the super? Or is it something that you’ve been doing a long time but you’ve actually used the money on the way through and set yourself up very nicely? You’ve already got other assets that can replace the cash flow that the business provides, and therefore the emphasis on that sale price is not as great. It’s not as necessary. That’s one element. The second element is around the saleability of the business itself. If you get some coaches and they’re talking about exit, this is the piece that they’ll look at only. And this is where, because it’s only one of three parts, so that’s where it’s quite dangerous. And then even this saleability piece is actually about finishing what I call finishing unfinished business. It’s actually about doing the stuff that you put off for as long as you’ve been putting it off for because you don’t want to do it. You don’t like doing it. It’s getting all the ducks in the row, getting all in the shape that if I was to sell your business in a box, all the bits are there, all the bits are working and everything is contained so I can hand that entity over to someone else. Joanna: We call it getting transaction ready. It’s a real theme at the moment. 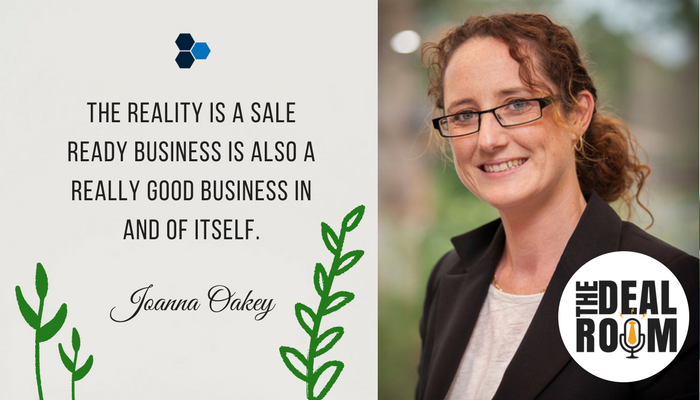 It’s certainly things that we talk about a lot in terms of the importance of getting a business in the position where it’s sale ready at any point because the reality is a sale ready business is also a really good business in and of itself in any event. Usually, it’s a much tidier business than businesses before they’re sale ready. Denise: Well, we’ve got businesses sale already before. Then the course of things starts, and then they don’t want to sell it. But that’s perfectly fine. People don’t sell except for reasons of health or something that kind of comes out lips sealed. But business owners don’t sell perfectly humming businesses. You don’t need to. There’s no need to get out. And then usually it’s other mitigating circumstances that will bring it to the fore really. But then on that third piece, which is actually one of the most crucial pieces, which is about the business owner themselves. Nobody has this conversation. If that business is 10, 15, 20 years old, it has been at that dining room table with that family whether you like it or not. That thing is there represented day in day out. It’s paid for the roof over their head. It’s paid for the kids’ fees, school fees, whatever it’s paid for. To think that you can just pull that dining room chair away and not impact the owner or the family is naïve, absolutely naive. So there’s lot of the conversation, especially if I’ve got time. It’s a whole lot easier to go towards something than it is to move away from something. And we’ve had business owners sabotage sales unintentionally, but they’re not ready to let it go. Joanna: Oh! I see that all the time. It’s fascinating the emotional journey that happens in a sale environment. Denise: To suggest that business is not personal is bullock. I’m talking about the smaller sized businesses that I deal with all day every day, so anything under 10 million turnover. When you’re starting to get up into the bigger realms, you become more and more disconnected because you’re not as close to clients. You’re just not as close because you’re running a bigger thing. I get that. But when you’re in that smaller category, it has to be personal because you are in the mix. Joanna: You work a lot with accountants. I think we’ve discussed this in the past. I’m really interested to hear (and I’m sure some of our listeners would be interested to hear) what your insights are into working with accountants in this area and suggestions you might have in relation to how accountants are dealing with their clients as they’re building up to a sale or a purchase. Denise: Sure. Yes, we do work closely with accountants. In the actual sale transaction itself, we actually got an accountant and a lawyer and a coach perhaps and a financial planner on both sides. We are very much the project manager, kind of facilitator role. Somebody has to be in the middle to keep this thing on track because we’ve got qualified opinions on both sides. So that’s the actual process itself. We move into that facilitator role with the view that the transaction will finalize and therefore we work closely with the accountants and the lawyers and so forth on both sides to get it to the point where it will finish. It will actually settle. Joanna: That’s the sale process itself. That team approach is great. We deal with lots of different types of professional approaches within our legal practice. But certainly I find the transactions that move the smoothest and the quickest are where you have everyone working together as professionals, as a team. That’s a really important point that you’re making there. Denise: I want to add to that I actually want them in the same room. The ones that we can get through as smoothly and as seamlessly and as timely as possible is where we can actually get all the professionals that are required to do this in the room at the same time where possible. It’s not always possible I know. But that’s our ideal because what also happens is, from the business owner’s perspective, what I call the Silo Effect. They’re getting advice from their accountant. They’re getting advice from their lawyer. They’re getting advice from the others that I mentioned before. Unless there’s somebody there holding their hand that they know can help guide them through this whole thing, if they’re left to synchronize all the stuff that they are told on their own, that’s when holes form. That’s where poor decisions are made because as a business owner you don’t know what you don’t know. So you’re relying on your professional services that you’re hiring to assist you. But to do that as in Silos can be equally as dangerous or equally as non-effective. So our ideal is where we can get the whole gang in the room and we spend an afternoon on it and we thrash it out and then everybody’s on the same page. And then the contract reflects that. Joanna: Great. And so in working with your accountant obviously one of the things that you’re suggesting is that it’s great for accountants to get on board with the lawyers, get on board with the brokers and work together as an integrated team which I wholeheartedly agree with. What are other areas that you think it would be really useful for accountants to have more of an understanding of when they’re dealing with their clients in this lead up to a sale or purchase? Denise: We’ve got a growing number of accountants that default to us to do the appraisal piece. Whether that’s for selling tomorrow or whether that’s selling in two years’ time, it doesn’t really matter for all the reasons that we’ve mentioned so far about market realities and playing in this space day in day out and understanding the different industries and the different rules of thumb that apply. Instead of second guessing, they’re bringing us in to do the appraisal piece for their client on their behalf. What they’re doing is either allowing us to come in and talk to the client and present their appraisal information or they’re doing it themselves and using it as an advisory piece to work with them. If it’s more likely to be over a longer period of time, they’re doing it. Then we’ll come in again in maybe another 12 months, 18 months’ time and we’ll do it again. And that’s very much about understanding essentially, if you don’t like the price today and you’ve still got the time, energy and effort left in you to want to adjust that price, then these are things you could be doing to assist to adjust. Some of the accountants are picking up that consulting role, that advisory role. Joanna: I think you raised some really interesting points there and I just wonder if implicit in what you’re saying in relation to the way you work with accountants is that you’ve identified this issue that sometimes occurs in how accountants or other advisers are dealing with clients in terms of talking valuation. Is that why you work with accountants in terms of providing these extra valuation services? Denise: Yeah, essentially. Just around the definition of appraisal and valuation. From our point of view, we talk about appraisal being a more general exercise that arrive at a price range from a saleability point of view. A valuation on the other hand, and we have accredited valuers here that do these on a regular basis, but a valuation on the other hand is more about it being a full blown valuation, costing a whole lot more dollars. Quite often the extent of the valuations depending on what it’s for, they’ll be used for things like partnerships split or court proceedings or partnerships fall-out, things like that. What I’m talking about is the appraisal piece versus that valuation part. And as I said, we’ve got accredited valuers here that can do that side of this as well. It’s really about what the information is to be used for which is the best provision of the exercise that will produce what’s required. Joanna: Just as a general question, what’s your suggestion in relation to what advisers, whether they’re accountants or consultants or whatever the case may be, should be doing in ensuring that they’re helping their clients get sale already? Denise: Talk to someone like myself who does this all day every day. But not at the theory level. I do not doubt there is absolute logic in some of what is expected to happen. If we tweak it here, it should relate there. But if you don’t give it enough time, you don’t give it enough air cover, you don’t give it enough effort. A 12 month exit plan roll out to try and tweak so many things invariably doesn’t always roll out on the bottom line. When we go to market, what we’re looking at is the profitability of the business and the quality of it. 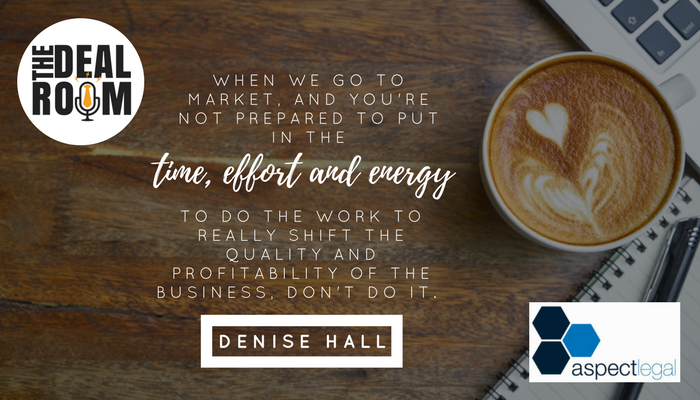 If you’re not prepared to put in the time, effort and energy to do the work to really shift that quality and shift that profitability, don’t worry about it. Don’t do it. But if you as a coach or an accountant or whatever can really see that in the time frame that the business owner has stated that they’re prepared to give it a go, can really see a way to shift it. That might be because I’ve got a piece of IP that they really need to push out to the marketplace or something like that. That can be done reasonably in a reasonable time frame then things like that are worth doing. But if in 12 months it’s actually not going to look a whole lot better than it is now, then go to market now or not waste the effort or the energy or the money on something that’s actually not going to make that much difference. The only way you’re going to know what will actually make a difference is to talk to someone like ourselves who know what buyers are looking for. They’re who we talk to all day everyday. We know what they’re looking for. We know where they see the value and what I as a business owner think is valuable is not necessarily what the buyer does. Joanna: Absolutely. I think that’s a really good point for everyone to bear in mind. Just because you think it’s important or valuable doesn’t necessarily mean that someone coming into the business would also see that as important or as valuable as you think it might be. Denise: Just in addition to that. My dear colleagues always say that what a buyer pays is the price. The reason they pay that price is the potential. But to think that you’re going to pay for potential that has not been realized does not happen. Joanna: That’s a really good point. I think we’ve covered some really important topics here. Just as a bit of a rehash, we heard about how you built and sold your first business and how that really contributed to the concepts that you’re using now in dealing with your clients in getting ready for an exit and of course dealing with them at exit. Do you have any action steps for any of our listeners who are listening, maybe for the businesses who were trying to get themselves sale ready, what are some of the action steps that you might give them that may be different to the sorts of action steps they might be hearing elsewhere? Denise: Get an appraisal. Get a line in the sand today for your business in your industry. If you don’t want to sell it tomorrow, that’s OK. Then we’ve got time to talk about levers to pull in order to ideally (can’t always guarantee it obviously) come up with an appraisal that you’re more likely to feel comfortable with in a time frame that suits. But really that appraisal tells what a business is worth at any given time whether that be for the business owner, the clients, the accountants or whoever. It is so fundamentally important. I can’t emphasize that enough. Joanna: Excellent. Thank you so much Denise for coming to talk to us. If any of our listeners or accountants are interested in connecting with you, finding out more about you, they can do so at your website at businessbrokers.com.au or find you in LinkedIn, I guess that’s another way. Denise: LinkedIn would be the best place. Just look for Denise Hall, Business Value Analyst and you will find me easily. Drop me a message and/or connect, either way I’m happy to talk to as many business owners and accountants and those that play in the business ownership space. The more refined we can get this and the more that we do work as a team collective the better we can serve as our clients.